Research into local hop production has been ongoing for several years at the UF/IFAS Mid-Florida Research and Education Center in Apopka. Few plants capture as much interest and passion as hops (Humululus lupulus). Hops give flavor, preserve beer, and put the “craft” in craft brewing. With hops as a key driver of craft breweries, there is a need for scientifically accurate agricultural research to identify opportunities and challenges of growing the crop in the Southeast U.S., specifically in Central Florida. Given this interest in hops, it is critical to describe and discuss myths and their corresponding realities, successes, and challenges we face with cultivating hops in Florida. Let’s take a clear-eyed and rigorous look at these myths that are shaping the present and future of hops research. Reality, Success, and Challenge #1: Hops can be cultivated in Florida; however, keeping out diseases, such as downy mildew, is key. Hops have been cultivated at UF/IFAS Mid-Florida Research and Education Center (MREC) in Apopka for more than half a decade. Concerns of disease, primarily downy mildew (Pseudoperonospora humuli), were at the forefront of concerns initially, but have yet to be detected. Although downy mildew can be found on many crops throughout the state, the species of downy mildew that infects hops is host-specific and will not simply spread to hops unless introduced. Ensuring we start with disease-free materials is the best method to avoid introduction and spread of downy mildew and other diseases. Tissue-culture produced hops certified disease-free are the best offensive technique to reduce downy mildew concerns and to reduce accidental importation of other pathogens into our state. Purchasing and planting hops as rhizomes – vegetative underground plant tissue that has historically been used to start a hop farm – may contain unwanted pathogens and disease. For example, in 2015 hop researchers in West-Central Florida mistakenly imported hop rhizomes containing Apple Mosaic Virus. Once identified, all hops plants had to be terminated, the hop yard fumigated, and tissue-culture produced plant material purchased and transplanted to reestablish the hop yard. Careful selection of disease-free materials is critical to avoid introduction of disease and its associated costs. Reality, Success, and Challenge #2: Florida-grown hops are of good quality, but will require analytical testing before being sellable to most brewers. Hops produce several key compounds of interest to brewers. Among them are alpha and beta acids (responsible for bitterness) and volatile aromatic oils (responsible for hop aromas). Bittering acids and volatile aromatic oils quality are influenced by cultivar, plant age, environmental conditions, and postharvest techniques. These quality factors dictate their ideal use when brewing. In 2017, hops cultivated at UF/IFAS MREC were used for sensory evaluation research. This work showed that Florida-grown hops had unique sensory qualities and suggested which cultivars may be best for specific styles of beers, such as India Pale Ales. Following on this work, current research is evaluating the influence of postharvest techniques on dried hop quality. Regardless of cultivar, technique, age of plant, or postharvest drying techniques, analytical analysis of hop bittering acids will be necessary before hops can be sold to commercial brewers. Brewers need this information to calculate how much hops are needed to achieve the flavor they are looking for in their finished beer products. Without this information, use of Florida-grown hops in commercially produced beer will be limited. 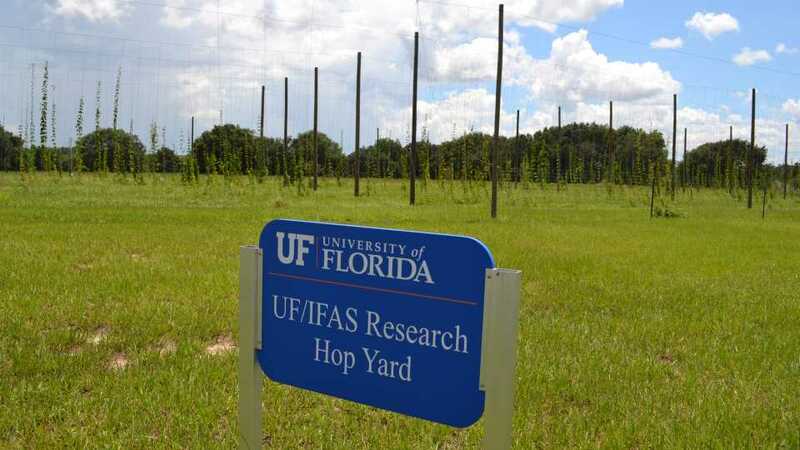 Since 2012, more than 20 hop cultivars have been trialed at UF/IFAS MREC using tall (20 foot) and short (13 foot) trellis systems. Reality, Success, and Challenge #3: Yields are influenced by cultivar, but none have produced high yields similar to that observed in prime hops-growing regions. Cultivar selection is indeed key to increased hops yield. More than 365 hop cultivars have been cataloged, but far fewer are available for commercial production. Greatest hop yields were observed from ‘Cascade’ and ‘Northern Brewer’ hop varieties at 1.5 and 1.4 ounces dry per plant annually, respectively (3). Greater yield has been reported for these varieties when cultivated elsewhere in Florida; however, hops were not dried to the industry standard of between 8% to 12 % moisture content, which also is required for storage to avoid mildewing. Failing to report moisture content in hops can mislead or confuse hop growers and buyers since cone weight decreases drastically when dried. Adding to the confusion, hop yield data is oftentimes reported in units of pounds per acre. When attempting to interpret this information, one must know the number of plants per acre to avoid misrepresenting hop yield data. For example, yield would be misleadingly high if reported as 1,500 plants per acre compared to 1,000 plants per acre. Reality, Success, and Challenge #4: Hops production in Florida appears not profitable based upon commercial production cost estimates and current hop yield data. Cultivation of hops requires the purchase and installation of unique equipment and supplies. As a tall-growing, vining plant, hops cultivation needs poles and high-tension wire to train plants along with specialized harvesting and drying equipment. Capital purchase and labor estimates to establish a hop yard, developed by Michigan State University and the University of Vermont, are approximately $18,000 per acre. Annual field, harvest, and farm overhead expense estimates total approximately $8,100 per acre. Given yield of 1.5 ounces of dried hops per plant (as recorded from ‘Cascade’ hops during the 2017 UF/IFAS MREC experimental trial) and 1,000 hops plants per acre, one would expect approximately 94 pounds dried hops per acre annually. With an estimated sale price of between $7 and $14 per pound and estimated annual production costs of $8,100 per acre, one would expect to lose between -$7,442 (at $7 per pound sale price) and -$6,784 (at $14 per pound sale price), excluding capital investment costs. Although hop production in Florida is possible, to be profitable, yields have to be much higher. Reality, Success, and Challenge #5: Lights can be used to increase hop yields; however, costs of lights and electricity do not provide sufficient gains to be profitable. Almost five decades ago, researchers demonstrated they could manipulate and control the vegetative and flowering cycles of hops with lights (4). This technique, called photo-extension or interruption, is often employed in greenhouse production of flowering ornamental crops. However, unlike ornamental greenhouse production where fewer lights are needed and profit margins are high, large-acreage agronomic crops, such as hops, make purchase and use of lamps economically daunting. Recent research in Florida examining the use of low-energy consuming LED lamps (14w; Philips GreenPower LED Flowering Lamp, Philips USA), designed to control flowering and increase yield of hops, concluded yields could be nearly doubled (153.4 to 181.1 pounds dried hops per acre) through light extension techniques (1). Although a significant gain in yield resulted from use of lamps, costs of lamps and electricity prohibits cost-effective commercial implementation of this technique. For example, for lamps to be effective in their manipulation on plant growth and flowering, approximately 350 are needed per acre. Costs of lamps per acre total approximately $14,000 (Hort Americas, Bradford, TX), excluding the cost of installation and wiring, which would likely double costs and so must be accounted for in budget estimates. With the use of energy efficient 14w LED lamps operating five hours each night for a duration of three months, estimated energy use was 2,205 kWh. With average cost of commercial electricity in Florida at $0.0904 per kWh in May 2018 (2), costs to operate lamps totaled $199.33. Assuming again a sale price of between $7 and $14 pounds for dried harvested hops and a yield of 181 pounds per acre, total sales would yield between $1,267 (at $7 per pound sale price) and $2,534 (at $14 per pound sale price). With annual field, harvest, and farm overhead expense estimates totaling approximately $8,100 per acre and the additional costs of electricity totaling approximately $199, a loss of between -$7,032 (at $7 per pound sale price) and -$5,765 (at $14 per pound sale price) per acre is estimated, excluding the capital investment costs of lamps and their installation. Hop yield can be increased through use of lights; but the additional costs overwhelm additional profits. Although electricity costs could possibly be reduced if a shorter duration of light interruption could be demonstrated, costs of lamps and their installation alone would still be cost prohibitive. Reality, Success, and Challenge #6: Hops may require chilling hours to remain vigorous each year. Hops thrive in temperate climates with seasonal fluctuations in day length. Temperate climates also mean much colder winters, and conventional wisdom holds that hops require extended hours of temperatures near freezing during winter to remain vigorous each year. Lack of chilling hours in the warm tropical and subtropical climate of Florida raises concerns about hops’ long-term production potential. Limited research on the influence of chilling hours on hop growth and yield prohibits long-term estimation of hops performance in Florida. Current research efforts are ongoing to determine if cultural practices can simulate chilling hours in hops. Reality, Success, and Challenge #7: Future potential of hops cultivation as a commercially profitable crop is indeed limited and not supported at this time given current cost and profitability estimates; however, hops cultivation can still be advantageous to homeowners and agritourism operations. Large-acreage commercial cultivation of hops is not likely to be profitable given estimated cost. Where profitability is not a main concern (e.g., homeowner and/or home brewer) and local, fresh hops are still in demand for specialized brewing, hops production can indeed be viable. Hops can be a valuable marketing tool in agritourism operations where the costs of hops cultivation could be offset by sales of other farm goods, such as wine or seasonal fruits and vegetables, especially if the attraction value of hops increases visitors and sales. More synergistically, hops could be very valuable if an agritourism operation partners with local craft brewing operations to maximize public interest and marketing efforts. However, the caveat would be that hops cultivation within agritourism operations are seen as a marketing expense and not profit-generating in itself. 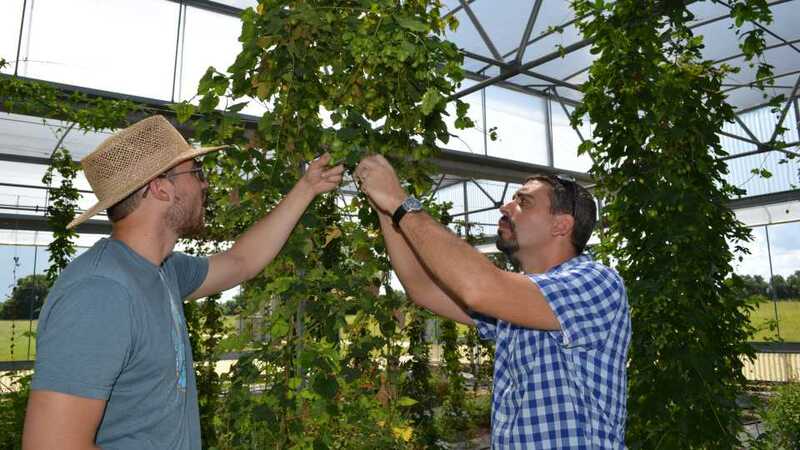 With support by the Florida Department of Agriculture and Consumer Services, scientists at UF/IFAS MREC have begun efforts to research the development of hop cultivars bred specifically for Florida’s unique environment. 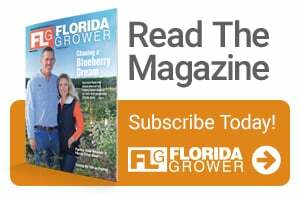 If successful, like blueberry breeding efforts of the past, Florida hop cultivars will help meet the demand of its passionate and enthusiastic agricultural producers and craft beer fans alike. Author Note: Kevin Lombard, Angela Colonna, and Roger Kjelgren contributed to this article. 1. Agehara, S., T. Silvasy, Z. Deng, and S. Bollin, 2018. Improving establishment of hops by optimal selection of cultivars, plant materials, nitrogen fertilization, and plant spacing in Florida. HortScience 53(9):S183. 3. Pearson, B.J., 2018. Growth and strobile yield among 20 hop (Humulus lupulus) cultivars utilizing a traditional tall-trellis production system in Florida. HortScience 53(9):S138. 4. Thomas, G.G and W.W. Schwabe, 1969. Factors controlling flowering in the hops (Humulus lupulus L). Department of Hop Research and Department of Horticulture, Wye College, University of London, pp. 781-793. 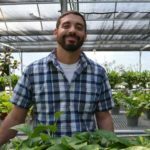 Brian J. Pearson is an Assistant Professor of environmental horticulture based at the UF/IFAS Mid-Florida Research and Education Center in Apopka. See all author stories here.